Four message forms per page. Insertable stop card prevents write-through. Spiral binding makes turning pages fast and effortless. 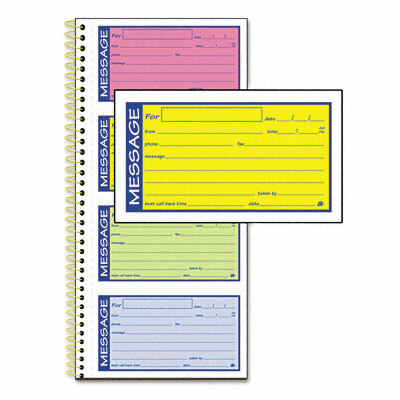 Track and return messages quickly with an easy-to-use spiral bound message book. Improves customer service by keeping accurate message records. Duplicate carbonless canary copies. Four message forms per page. Insertable stop card prevents write-through. Spiral binding makes turning pages fast and effortless.